The best meals have the ability to take you back in time. And that’s exactly what Will’s Fargo, the steakhouse owned by Holman Ranch, aims to do, remind people how amazing (and delicious) simplicity can be. 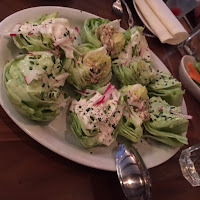 Will’s Fargo, a rustic eatery in Carmel Valley, with its ranch-inspired ambiance and exceptional cuisine, whisks their customers back to a time where quality was key. At Will’s Fargo food comes directly from the farm, or ranch, straight to the customers plate, and hospitality is always served with a smile. In a day and age where quantity is valued over quality, it is refreshing to see a restaurant that values preserving the integrity of the whole dining experience - from the first greeting to the last bite. 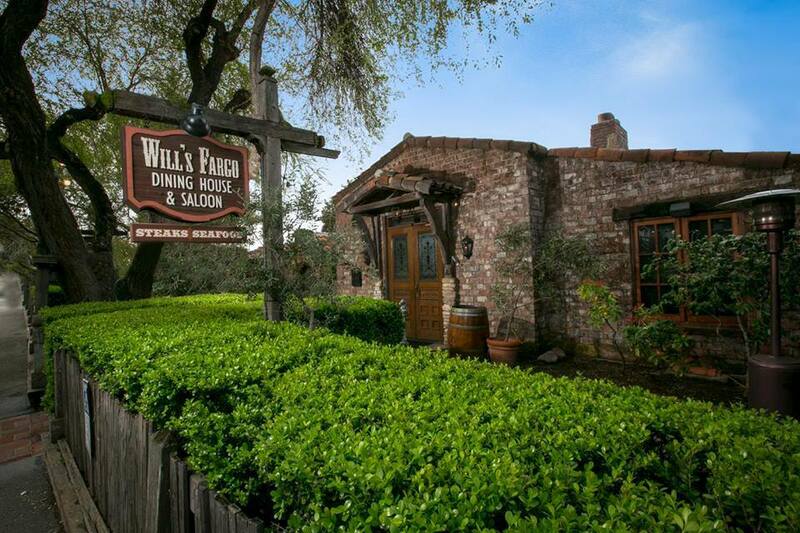 It is no wonder Will’s Fargo is voted the Best Steakhouse in Carmel Valley, receiving numerous accolades by visitors and locals alike. Edible Skinny was lucky enough to visit Will’s Fargo, owned by Holman Ranch, while staying on their gorgeous property. Holman Ranch is a local vineyard, and its jaw-dropping beauty and outstanding organic wines it has quickly become an Edible Skinny favorite. The owners of Holman Ranch used to be frequent visitors of Will’s Fargo, taking clients there for business lunches or after dinner drinks. Once the restaurant went up for sale Holman Ranch saw buying the restaurant as a natural extension of their service and offerings. Holman Ranch was already giving their guests breathtaking grounds to stay on, making exceptional wine at the highest standards, the only thing missing was a delicious meal to go with it. And those meals come with some history. The Will’s building has actually been around since the 1920’s and served as a road house located on the “milk run” between Monterey and Tassajara. Later it became a dinner house named The Carousel before Will Fay established Will’s Fargo Restaurant in 1959. The name was inspired by what the then-owner called a “dressed up saloon” interior. The design merged the personalities of a Victorian parlor with a western “Fargo” way station to make customer feel like they in a past era, dining at the ranch. 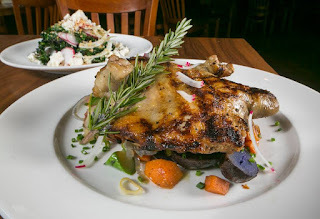 Under the ownership of Holman Ranch the ambiance of Will’s Fargo has stayed the same but culinary creations and melt in your mouth meats has transformed their menu. Headed by Executive Chef Greg Karjala, Will’s Fargo seeks to strike a perfect balance between fresh flavorful concepts and honoring the traditional taste of Carmel Valley. Karjala emphasis the beauty of seasonal cooking using only the freshest ingredients and the finest detail. Edible Skinny was blown away by Will’s Fargo. 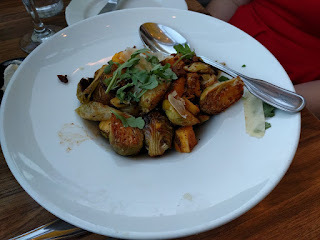 We were very impressed by not only the quality, but the ingenuity of simple dishes that combine one or two ingredients to create big flavors, flavors that compliment not overpower. Edible Skinny started our meal with light appetizers that were refreshing and delicate. Our favorites were the sourdough crouton with paprika, a 6 minute egg, white anchovy, and arugula. As well as the wedge salad trio, classic blue cheese, blue cheese vinaigrette, green goddess dressing placed perfectly in lettuce cups, with flavors that were bright and complex. For dinner we loved the braised short ribs that melted like butter in our mouths, which were served with goat cheese, polenta and pickled green tomatoes. Another standout was the rich and creamy, asparagus and asiago raviolis, with a soubise sauce and braised green, grana padano. We also enjoyed some of Will’s Fargo’s famous sides like their -sweet corn with cilantro and lime and roasted mushrooms, with tarragon butter and lemon. Ending the night on a sweet note, Will’s Fargo created simple and sweet desserts that are just the right portions for any sweet tooth. For dessert we enjoyed a white chocolate mousse with hazelnuts, brown butter, pineapple as well as roasted strawberries with pernod poached rhubarb, balsamic glaze, and sweet cream. Just remembering this meal makes our mouth water. 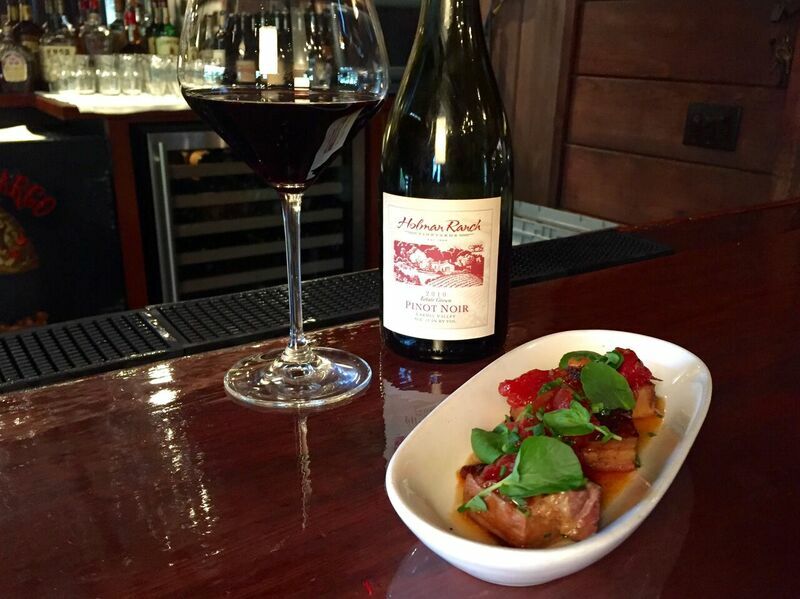 And no meal would be complete without an exceptional glass of wine. Especially when you have three outstanding Holman Ranch labels to choose from (more about that from Edible Skinny later this week.) Jarman, Holman Ranch’s, higher-end label has a tasting room next to Will’s Fargo, so dinner can sip on their various organic varietals while waiting for a table. Or they can enjoy one of Holman’s original label with a number a delicious options to choose from. Edible Skinny loved Jarman’s Chardonnay made from the finest local fruit, as well as Holman’s rich and velvety Pinot Noir. 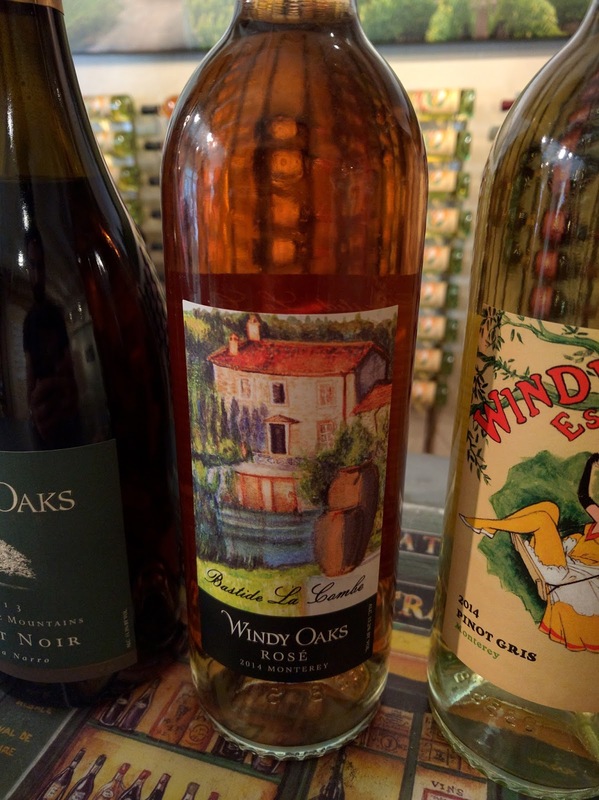 Will’s Fargo also has their very own label, featured at the Hofsas House, when guests get a wine and cheese plate upon check in. 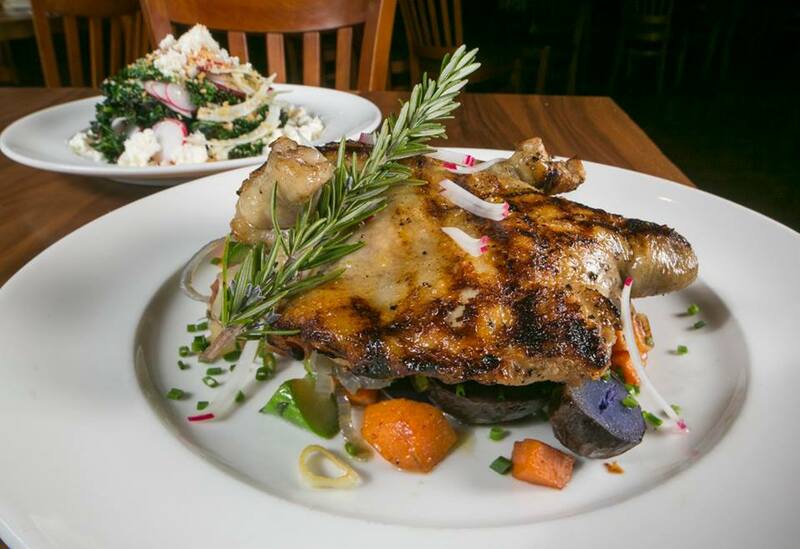 Whether you want a great glass of red wine and steak so tender you could cut it with a spoon, or a glass of Chardonnay and wedge trio that is light and tangy, Will’s Fargo has something for all palettes passing through. Will’s Fargo, hands down one of the best, can’t-miss eateries in Carmel Valley, owned by an exceptional winery with uncompromised taste only offers the best service and most delicious dining, guaranteed to bring you back in time. Paradise doesn’t have to come with a hefty price tag, but it should always taste delicious. On our recent trip to Monterey, Edible Skinny was lucky to visit The Beach House, a casual eatery in Pacific Grove, with good food, friendly smiles and an unforgettable view. 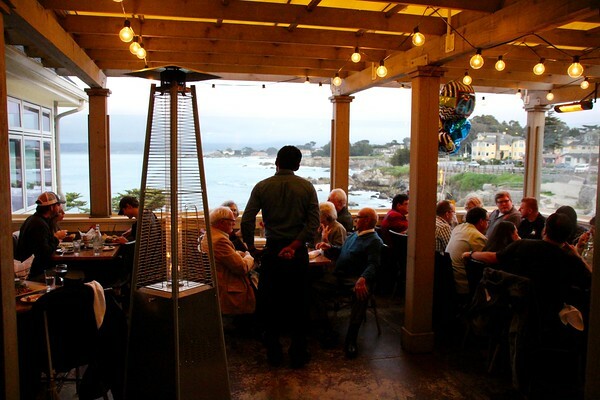 In fact, the Beach House was voted the Best New Restaurant on the Monterey Peninsula in 2013 and 2014 - and we can see why. Dining at the Beach House is an instant vacation. 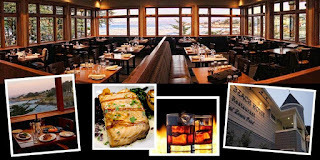 While the Beach House has a varied menu for every land, sea and and veggie lover, the most memorable thing about the restaurant is the jaw-dropping panoramic view of the Monterey Bay National Marine Sanctuary. While the restaurant offers both inside and outside dining, we highly recommend sitting and enjoying a relaxing meal on their outdoor patio, which is only made more fabulous by the Beach House’s exceptional wines list, which highlights the the best of the region. 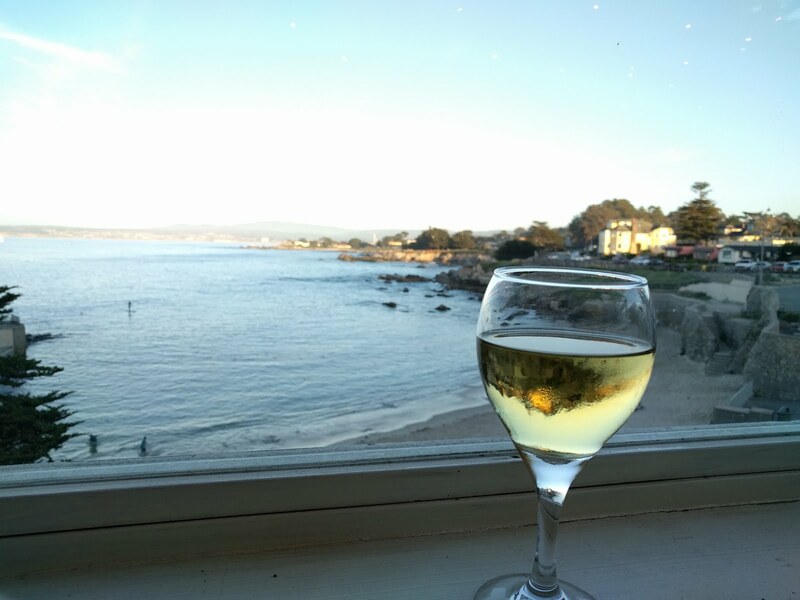 Edible Skinny sipped on Caymus Conundrum White Blend, a buttery bliss, while enjoying views of marine life and lapping waves. The Beach House is located at Lovers Point, in Pacific Grove. Lover’s Point is a scenic spot that oozes romance and beauty, visited by locals and tourists alike. 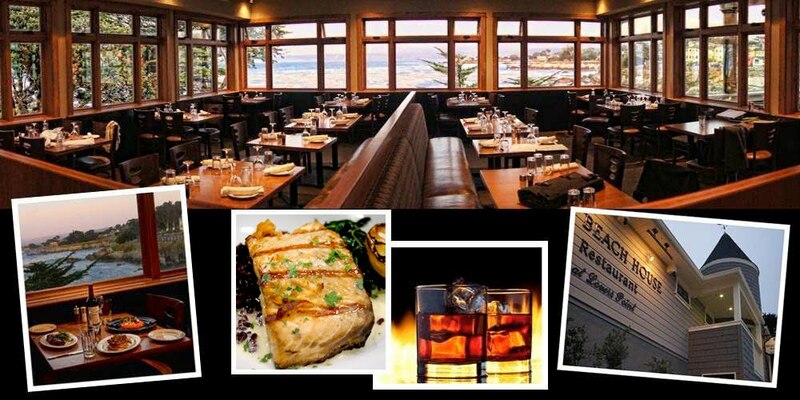 Pacific Grove is also the starting spot of the beautiful Pebble Beach 17-mile drive, making Beach House the perfect first, or last stop, for those looking for a bite after a long day of sightseeing. The Beach House also has a wide variety of entrees and appetizers that showcases the area’s culinary culture. Offering everything from Cider-Cured Charbroiled Pork Chop to Scallop pot pies, to Flash-Fried Monterey Calamari; their menu is both diverse and creative. Edible Skinny decided to begin their dining experience with the Beach House’s Charred Brussels Sprouts. We wanted something that had a lot of taste, but that wouldn’t fill us up. This dish with its locally made chorizo, roasted butternut squash, garlic confit, rocket arugula, shaved parmesan was the perfect juxtaposition of savory and spice. For entrees we wanted to experience both land and sea. Our first entree, the Bacon-Wrapped Meatloaf, tasted like a savory slice of home. 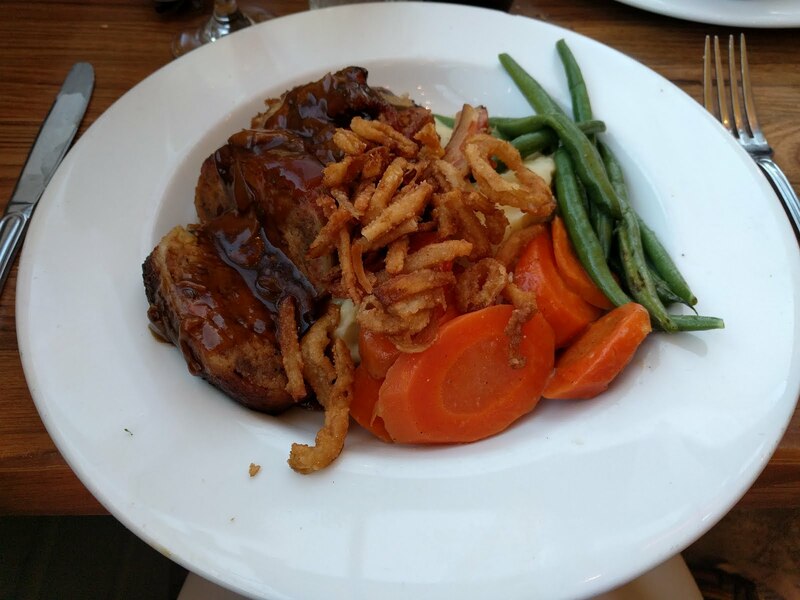 Served with yukon gold potatoes, glazed carrots, sauteed mushrooms, green beans, mushroom gravy and crispy fried onions- this was comfort food at its finest. It would have been silly of us to be in Monterey and not indulge in a little scrumptious seafood. For our second entree, enjoyed the Steak, Scampi & Fries. This USDA Prime center-cut sirloin with grilled prawns scampi, garlic butter and fries was a perfectly portioned, taste trifecta. 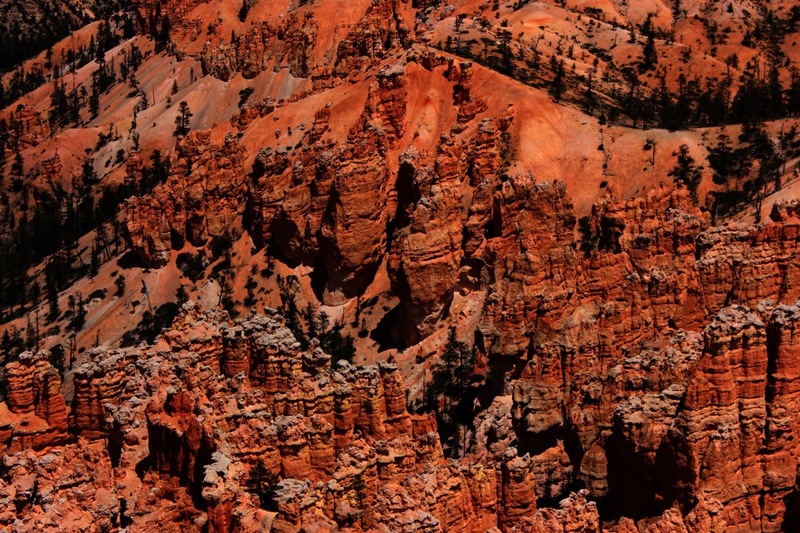 A Helluva a Place to Lose A Cow: Bryce Canyon National Park. Hello Hoodoos!!! Last week I was lucky enough to take a visit to the imaginarium of wonder known as Bryce Canyon!!! 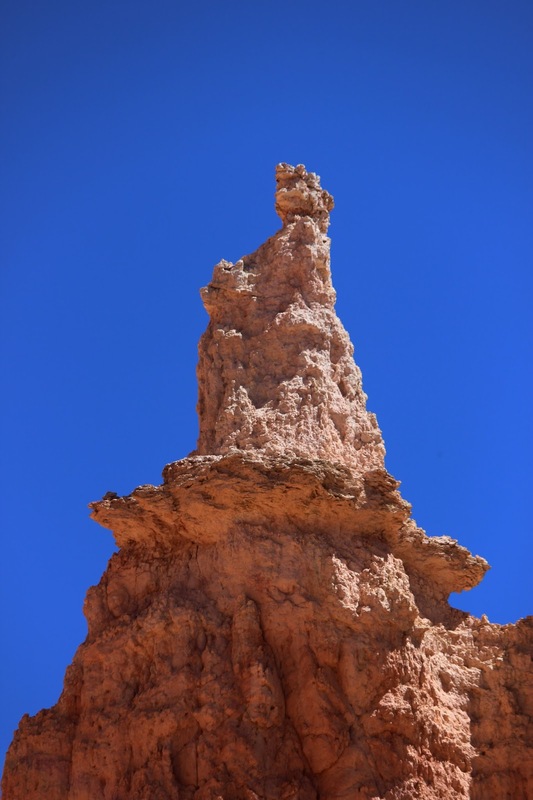 Located in southwestern Utah, this National Park houses one of the largest collection of Hoodoos in the world (odd-shaped pillars of rock left standing from forces of frost weathering erosion). The red white orange pink colors of the rocks provide spectacular views for the 1.5 million park visitors per year. 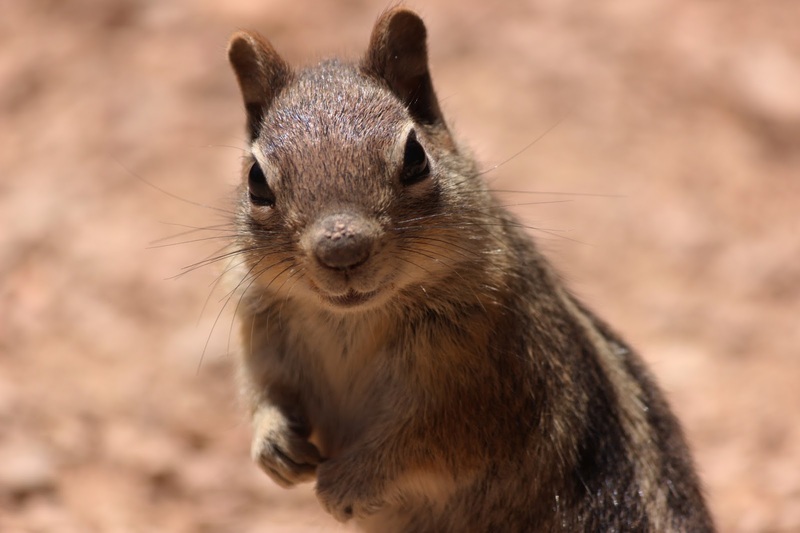 Despite its name, Bryce Canyon is not a canyon, but rather a collection of giant natural amphitheaters. Regardless of its moniker, its a site to be seen both from above and below. 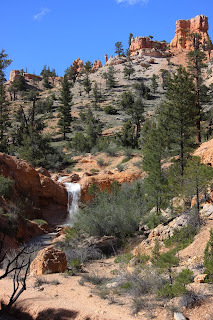 The Bryce Canyon area, named after Mister Ebenezer Bryce, was first settled by Mormon pioneers in the mid-18th century. 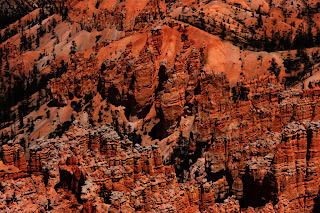 Bryce grazed his cattle inside what are now park boarders, and thought the amphitheater would be a “Helluva place to lose a cow.” The area around Bryce Canyon became a National Monument in 1923 and was designated as a National Park in 1928. Bryce Canyon spans 35,835 acres. Its 37 mile circuit scenic drive provides access to 13 viewpoints over the amphitheaters, which are especially amazing as the sun rises and sets. 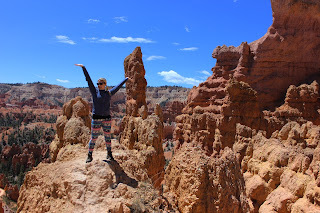 Some of our favorite hikes included Mossy Cave, Navajo Loop, and Queens Garden (named so for a rock that looks strangely like a statue of Queen Victoria in London). The park has a 7.4 magnitude night sky, making it one of the darkest in North America. Stargazers can see 7,500 stars with the naked eye at Bryce (while in most places fewer than 2,000 can be seen due to light pollution and in many large cities only a few dozen can be seen). 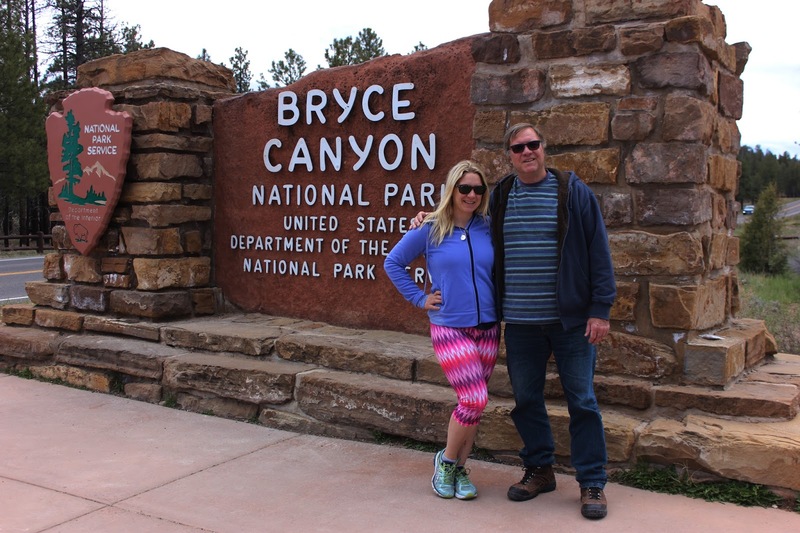 While visiting Bryce we stayed overnight in the park at the 114-room Bryce Canyon Lodge. The Lodge was built between 1924 and 1925 from local materials. In honor of those 7,500 stars, there is no ambient light at the Lodge from traffic, signs, or housing. Bryce Park Rangers (aka “Dark Rangers”) host public stargazing events at the Lodge and evening programs on astronomy while the Bryce Canyon Astronomy Festival held in June attracts thousands of visitors. So from red rock hiking to soulful star gazing, there’s no place like Bryce! Wine. Sophisticated, aromatic, tasty, and fun. But not for me. Wine has always made me nauseous and caused some major headaches. So when Edible Skinny was to visit Carmel by the Sea’s famous Wine Walk, I had my reservations about going. After I was shown gorgeous pictures of amazing ocean views and a city with a rustic small town feel, I was convinced to give it a try. But, as a science guy, I decided to come armed with some questions for the experts, and determined to get to the bottom of my wine related health issues. We had two Wine Tasting Passports, which provided us tasters with a wine walk flight of our choice at any 9 of the 14 tasting rooms for only $65. All of the tasting rooms are within a mile of each other. Our first two stops were Scheid and De Tierra. Both of these vineyards are unique in that they are organic and sustainable wineries, both holding current SIP certifications. SIP, sustainability in practice, is a certification which must be renewed annually, and certifies that the whole winery is free of synthetic pesticides and fertilizers, and requires sustainability not just at the grape level, but the entire ecosystem around the farm. There were three specific wines that I recommend trying on the Walk. As a beer guy, I was blown away by Scheid’s Triple Layer White. It reminded me of a well balanced session IPA; a little bitterness, balanced out with the full flavor of the three different white grapes – Viognier, Roussanne and Marsanne. At De Tierra, the Puzzler Red Blend stood out, with smoky fig notes, abundant cinnamon, and a little warm toffee on the finish. And if you are a fan of Rosé, stop by Windy Oaks Estate for theirs; crispy, light, but not lacking in full flavor of the Grenache grapes. 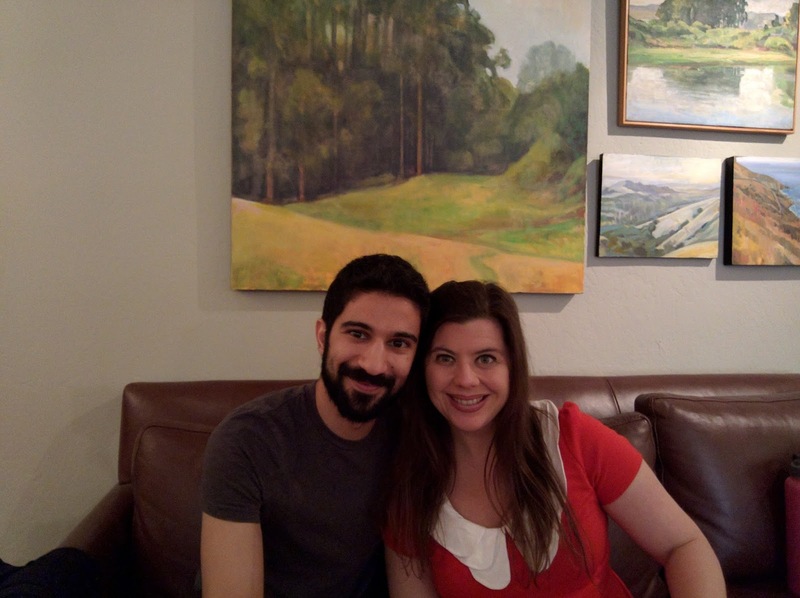 At each of the tasting rooms, I was blown away at the level of service with a smile and knowledge our hosts had. I was finally able to have all my questions answered, and was surprised to discover that the ever popular tannin and sulfite explanations to my wine sickness were not the answer. All of them agreed that it was mostly due to the incredible amount of additives used in the production of cheap wine; up to 76 different additives in some wines, and any one could cause allergic reactions. The wineries on the Walk maintain an incredible respect for the craft of wine making, and create deliciously pure wines that stand out. The stunning little town of Carmel, cool ocean breezes, and delicious wine all came together into a remarkable way to create a wonderful experience. And while we didn’t use all our passes, they do not expire, making this a regular trip to enjoy anytime of the year. With all of my questions answered, and a new world of sophistication opened up to me, I walked away from the Walk a very happy health nut. As always, drink happy, drink healthy, and drink responsibly! Cheers! Springing Into Loire Valley Wines at SmogShoppe!